It was a lengthy, setback-laden struggle watched by a city of increasingly curious people. 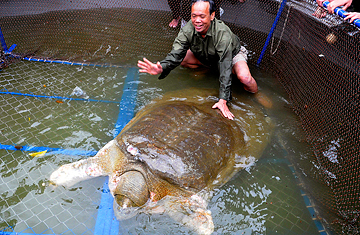 But on Sunday, Hanoi's legendary urban turtle, Cu Rua, was finally captured in the capital's central Hoan Kiem Lake. The 440-lb. (200 kg) creature, widely considered to be a deity that has protected the city for hundreds of years, was caught by dozens of Vietnamese soldiers after a first attempt to take the turtle in for medical treatment last month failed. Since last year, when photos of Cu Rua with lesions and sores appeared in local papers, conservationists have been worried about the ancient animal's health. A cold, dry winter lowered the urban lake's water levels. Pollution from nearby cafés and unusually high acidity levels in the lake also raised concerns. Nguyen Ngoc Khoi, CEO of KAT, the company in charge of catching the animal, hailed Sunday's procedure as a success. "The venerable turtle has some injuries around its neck, but the wound on its shell is healed," he says. "I believe it will be fine in two weeks." The turtle will now undergo tests and possible medical treatment at a specially prepared enclosure on an island in the lake. For generations, Cu Rua (Great-Grandfather in Vietnamese, though its gender remains to be determined) has been considered a deity in Vietnam. Many believe it is the same spirit that reclaimed the magic sword from the depths of Hoan Kiem that 15th century King Le Loi used to defeat China's Ming dynasty and win Vietnam's independence from its northern neighbor. Many in Hanoi have been waiting to catch a glimpse of the turtle for years. Last month, during the first rescue attempt, Pham Thi Ngoc Diep, a 22-year-old accountant, went to the shores of Hoan Kiem to watch. "I wish to see him once in my life," said Thi. "It may bring good luck to me and my family." Whether the turtle is actually 600 years old or possesses magical qualities may be up for debate. What's more widely accepted is that it is one of the most endangered species in the world. Many scientists think it is one of four known Rafetus swinhoei turtles living today. (There are two others in China, and a third was found in a lake outside Hanoi in 2007, where it remains.) If these are in fact the only remaining members of the species, Rafetus swinhoei would be the second rarest turtle species in the world after Lonesome George, an Abingdon Island giant tortoise (Chelonoidis nigra abingdoni) from the Galápagos who is, as his name implies, all alone. Local traditions in Vietnam are not exactly in the turtles' favor. Turtle meat, or ba ba, is popular throughout the Southeast Asian nation, and experts say that demand for the meat in Asia is pushing the extinction of many species. According to a recent paper published by the Turtle Conservation Coalition, 17 out of the world's 25 most endangered turtles are species found in Asia. Education for Nature Vietnam, a local NGO, claimed in a March report that local wildlife authorities regularly auction the creatures off to vendors on the false premise that they are old or sick. Still, it's unlikely that Cu Rua would be sent to captivity in China to breed with either of the other turtles there. Despite evidence of the animal's ailing health, many people in Hanoi objected to even removing it from its environment, and insisted that it be treated on the island within the lake. "This is not a regular animal," says Tim McCormack of the Asian Turtle Program. "It's a lot harder to treat." Not everyone thinks that Cu Rua deserves the attention it's getting. Bui Tien Dat, a 20-year-old student in Hanoi, says he cares more about events in Japan than what happens to the legendary turtle. "I think a lot of people are paying too much attention," said Bui one day last month. "It's not a really, really important thing."